Despite the headlines, the Middle East is not all war and conflict - with the entire region holding a depth of beauty, mystery and history like no other on earth. 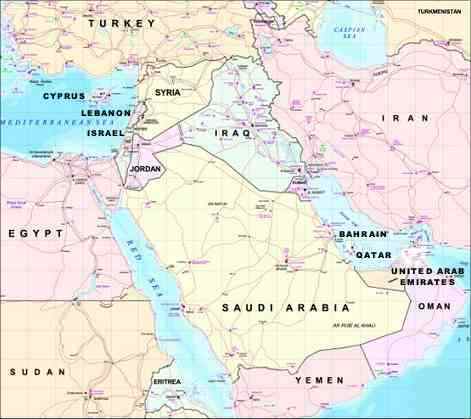 Middle East Travel Information and Travel Guide - The complete overview from Lonely Planet with guides to Jordon, Iran, Egypt, Morocco, the UAE and more including top picks of major destinations and tourist hubs, related photos, maps and online forum. Middle East travel guide - Wikitravel - Insider guide with advice on getting there and getting around, information on top cities and destinations, culinary specialties, suggested itineraries, related maps & safety tips. MidEastTraveling.net - Use the interactive map to surf the entire region with information on hotels & restaurants, shopping, major attractions, photo galleries, plus history & culture of Israel, Egypt, Bahrain, Jordan, Iran, Iraq, Syria, Turkey, Cyprus and more.